Bobby Green endured more tragedy and professional setbacks in the last year than most people will deal with their entire lives, but he’s still standing and looking forward to returning to the UFC in 2016. 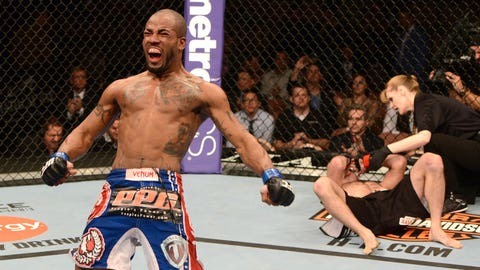 Green made a rapid rise up the lightweight ranks when he joined the UFC in 2013 by quickly winning his first four fights in a row, including a victory over former title contender Josh Thomson. Behind the scenes, Green was dealing with injuries that just kept mounting and finally his body just couldn’t take anymore. and he was forced into a pair of surgeries. "First, I had the first surgery from after the (Edson) Barboza fight, which was my (torn) quad," Green explained when speaking to FOX Sports. "I think from the quad, that counterbalanced all of my weight onto my other leg and it started to give me some problems and trying to make this work without my balance right and without everything right causing it to blow." As Green prepared for his next scheduled fight against Al Iaquinta at UFC Fight Night in San Diego this past July, his right knee gave out after just coming back from a torn quad in his left leg. This time it cost Green his ACL and lateral meniscus and put him back on the shelf for several months. But as much as he dreaded dealing with another injury, the time off forced the promising lightweight to evaluate everything that had been happening in his life. While Green’s fight career was threatened by injury, it was his personal life that really affected him on a daily basis after losing his brother and another friend while also dealing with turmoil at home. As it all started to pile up, Green finally had to take a step back and focus on himself while cutting out everything else. "I think I was just going through a tornado of emotions," Green said. "My little brother got killed, my older brother got shot, another friend who is really close got killed, so it was like all these people close to me were dying. I was having relationship problems so I was just spiraling. "I remember doing an interview right before the Barboza fight and I just started spewing my emotions. I was just so tense and under pressure and it just came all out. I think the interview was called ‘he said what?’ because I just went off. I was talking about retiring and stuff just because of how much pressure I was under." Once Green was forced to drop out of his fight with Iaquinta, he shut off all his social network sites and stopped answering calls from anyone who wasn’t a friend or family. Green has always been one of the most inviting fighters when it comes to doing media obligations or engaging with fans on Twitter or Facebook, but over the past year he was suffering silently while trying his best to never let anyone see him sweat. "I had to unplug," Green said. "There was just too many people and I always try to help people. Every time a phone call rings or my Twitter or whenever somebody asks for something, I try to help, but to get that from thousands and thousands of people it gets freaky and time consuming. It’s a wreck. "That was causing me so many problems. I try to be genuine and it was causing me problems in my relationships so I just had to shut the Facebook down." In the last few months while Green has been recovering from his knee surgery, he’s started to feel a real positivity about his career and his personal life as he prepares to return next year. Looking back on his aggressive tone before the fight with Barboza all the way through being knocked out of the bout with Iaquinta, Green barely recognizes that person anymore and he hopes his fans understand that they didn’t get the best out of him during that time. "I feel like my fans got a real bad side of me for a second. I started just being really angry," Green said. "I had some changes in my camp, too, during that (Barboza) fight. I’m really figuring out what coaches I want to be working with. I think we were going through a trial period where we were trying a new system and it didn’t work. It was just a bad training camp I guess and I had a lot of life issues and I couldn’t train like I wanted." Right now, Green is back to being himself and happy about all the choices he’s made in his life lately. His leg isn’t back to 100 percent yet, but he’s taking things slow and easy so when he’s ready to come back, the lightweight division will take notice of his arrival. Green would like nothing more than to jump back into the thick of the division because even on his worst day, he lost a close decision to Barboza in a fight he still believes deep down inside that he won. With everything else in his life hitting on all cylinders, Green is ready to show the world what he’s really capable of doing inside the Octagon. "My manager Jason (House) said he would like me be ready in June. So we’re going to shoot for June," Green revealed. "I just really want an important card. Something right. I want it to be something significant. Maybe it’s a Conor (McGregor) card with a bunch of Irish fans there. I love fans who appreciate fighting. I would look forward to something like that in July (at UFC 200)." "I will be coming back and I will be coming back with a splash. I promise you that."